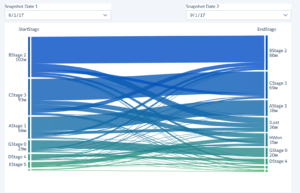 For those that work with Einstein Analytics and historic pipeline data, the upcoming Sankey chart is an exciting addition to the chart types suite. The purpose of the Sankey chart is to visualize how values flow from one dimension to another where the width of the flow line is proportional to the measure value. The difference between visualizing this flow using a Sankey chart and a bar chart is that a bar chart show each value from dimension A and all of the corresponding values in dimension B. Sankey charts condense that visualization and allow users to grasp the connections using the flow lines. The visualizations below show accounts and their corresponding purchases over the past year. The Bar chart lists each product that was purchased separated by the account. The Sankey chart condenses this information and allows users to highlight relevant data. By selecting the first account, users can see what that account purchased, versus the white space. Previously, the best chart types for white space analysis were heat maps and matrix charts. In regards to this type of analysis, the Sankey chart beautifully combines aspects of bar charts and matrix plots. Another useful application for this chart type is visualizing how opportunities flow from one pipeline stage to another given a dynamic date range. Using a Sankey chart would allow users to compare stage movement volume by glancing at the lines as opposed to comparing chart values or line lengths. Because the Sankey chart is still a new chart type in Einstein Analytics, it’s important to understand the nuances and workarounds. At this moment, if a Sankey chart lens is in a dashboard, users may notice that they are unable to highlight a value from one of the dimensions to see all of the connections to the other. As an example, because the stages Sankey chart is in a dashboard it’s only possible to select the lines connecting two stages. 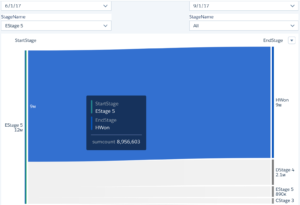 It’s not possible to select Stage 2 from the StartStage column to see all of the corresponding stages in the EndStage. Fortunately, this can be achieved by adding additional stage filters and faceting them with the Sankey chart. By selecting Stage 5 from the Stage dropdown, users can now filter the StartStage and see what stages those opportunities were in based on the end date. Another limitation of the Sankey chart is that only 2 dimensions can be grouped within the chart. Thankfully, with some advanced SAQL and selection bindings implementation, this too can be overcome. Sticking with the pipeline changes use case, if a user wants to track stage movement through multiple time periods, simply duplicate the Sankey chart, add an additional projection that finds where those opportunities are on a third date, and facet the charts. The Sankey chart’s ability to visualize a flow from one dimension to another is certainly a powerful new addition. 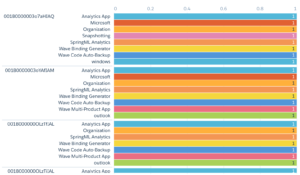 While the pipeline changes use case serves as one example of its use, the chart will help developers rethink their entire approach to visualization when working with multiple dimensions. Hopefully, the limitations on the lens options will be reduced in the future, but until then there are plenty of workarounds that will allow us to get the most use out of the Sankey chart.